Is your Website safe ? Must Know .. What is SSL Certificate ? Home » Shared Hosting » Is your Website safe ? Must Know .. What is SSL Certificate ? Do you have a website ? then I think you must know more about What is SSL Certificate? Why, I am saying this …. Ok… Please tell me first, Would you like to loose your business , sales , or site visitors. I am sure, your answer would be certainly NO. But, If your website is not safe against hacking, then it may happen that you can loose your customers. Because, Hackers can steal your customer’s valuable sensitive financial and personal data like Debit & Credit Card details, Bank Account related information, contact details etc for their own benefits. Now, you would be thinking that What to do ? How to check whether your website is safe or not ? Don’t worry there is already a SSL Checker tool available, through which you can check whether your website is safe or not. 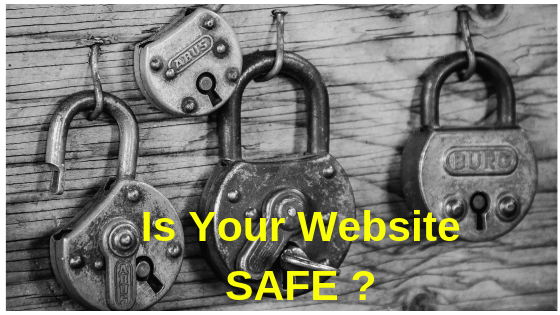 check Whether your website Safe or Not ? Friends, if you are really serious and take care about your valuable customer’s data, then you must know about What is SSL Certificate ? and How you can safeguard your website by applying SSL certificate. Now, Let’s discuss about What is SSL Certificate in detail. How it can be applied ? How much cost would occur if you purchase SSL Certificate for your website. SSL stands for Secured Socket Layer, a technology which establish a secured encrypted link between web server and your web browser i.e. ( Google Chrome, Firefox, MS Internet Explorer etc.). This link ensures to make your valuable data which is passing between web server and browser remain private. Probably you would have noticed that some website URLs is having “http/” and some with “https://“. The website whose URL starts with “https://” , meaning that SSL Certificate already installed on website and visiting the site is safe. Hope you understood properly what is HTTPS and SSL Certificate ?, but still some confusion then I suggest please watch the below video for better understanding. Most of people still do not care about their website safety. The reason is many people are not aware of the same because of their lack of knowledge. But, now on wards, safety of any website is going to be very serious. As per google Chrome July’18 updates, now an alert message “Connection is not secure” would be flashed, when users visits an unsecured site. When the visitor sees such annoying messages, definitely they will quit from your site and resulting you would be losing a prominent customer. If SSL certificate has been installed in website then, it looks like the following screen shot. To Secure you website, you must have a SSL Certificate in your website. Another great advantage is that, now Google give search engine ranking preference those websites, in which SSL Cerificate has been installed and activated. It means that, if you don’t have SSL Certificate on your website, your site may appear lower in Google search rankings compare to other’s site who has installed the SSL Certificate. So, How you can avoid Warning Message ? Don’t Worry, you can avoid the warning messages by installing SSL Certificate in your website. Almost, all hosting companies provides the SSL Certificate. At first, you can check with them, how much cost they are charging and what kind of SSL certificate offering to secure your site. If they are not providing, then don’t worry, I am giving some web hosting companies like Godaddy, Hostgator, Bluehost, Hostinger, Hostingraja and many other who offers the SSL Certificate. You can choose one of them according to your need. Even some Hosting companies offer Free SSL Certificate, if you purchase Domain and web hosting package from them. If interested you may check below such offers. To check what type of SSL certificate is best suitable for you, just keep reading and refer below. All SSL certificate are combination of a particular Validation Level + Types. Let’s understand what those Validation levels and types are. EV certificates provide the highest levels of security, trust and customer conversion for online businesses. EV certificates are issued only after the issuing CA has conducted rigorous background checks on the company according to the guidelines laid out by the Certificate Authority/Browser Forum. Whenever somebody visits a website that uses an EV certificate, the address bar will turn green in major browsers such as Internet Explorer, Firefox and Chrome. EV certificates are used by all major online retailers and banks and are highly recommended for businesses that wish to immediately build customer trust in their site. Suitable for : Recommended for sites requires encryption for more sensitive customer information, such as credit cards. Site owner information is more thoroughly vetted by the CA. (CA) using their established and accepted processes. Each OV certificate contains full company name and address details, which means they provide significantly higher levels of assurance to end-users than Domain Validated certificates. However, because they are not validated to the CA/B forum standards, they do not possess the ability to turn the browser address bar green. Suitable for : Ideal for securing sites that take in customer info and require login credentials. Site owner information is verified by the Certificate Authority. DV certificates provide the same high levels of data encryption as the other validation levels but do not provide assurance about the identity of the business behind the website. Whereas EV and OV certificates are only issued after the applicant organization has been manually vetted by a certificate authority. DV certificates are issued after domain control has been established using an automated, online process. DV certificates are a popular choice for small sized web sites because of their faster issuance times and lower price. suitable for : Perfect for blogs, personal websites. It does not verify the site owner information and should not be used for e-Commerce or sites that have a user login. A single domain certificate allows a customer to secure one Fully Qualified Domain Name on a single certificate. This certificate is available in DV, OV and EV variants at a variety of price points and warranty levels. The straightforward nature of the single domain certificate makes it ideal for small to medium sized businesses managing a limited number of websites or Individual website owners. A Wildcard certificates allows businesses to secure a single domain and unlimited sub-domains of that domain. For example, a wildcard certificate for ‘*.domain.com’ could also be used to secure ‘payments.domain.com’, ‘login.domain.com, ‘anything-else.domain.com’ etc. They also help simplify management processes by reducing the number of certificates that need to be tracked. A Multi-Domain certificate allows website owners to secure multiple through one certificate. Customers can easily add or remove domains at any time. This simplifies SSL management because administrators need only keep track of a single certificate with a unified expiry date for all domains instead of keeping tabs on multiple certificates. In addition, Multi Domain Certificate usually represent a cost saving over the price of individual certificates. Most of the time, the Hosting company from where you are going to purchase the SSL Certificate, their support staff will help you out to install the Certificate. So, you must try to get their help first. But, you can also do by yourself with little bit efforts. So, If you are technical person, then I assume that you must be knowing about cPanel, through which you can install the Certificate. But, if you are not so technical or facing some problem, then you can follow the following steps to install the Certificate through cPanel. After successful logged in you will see some Icons ( Refer below screen shot) , through which you can do SSL related task. 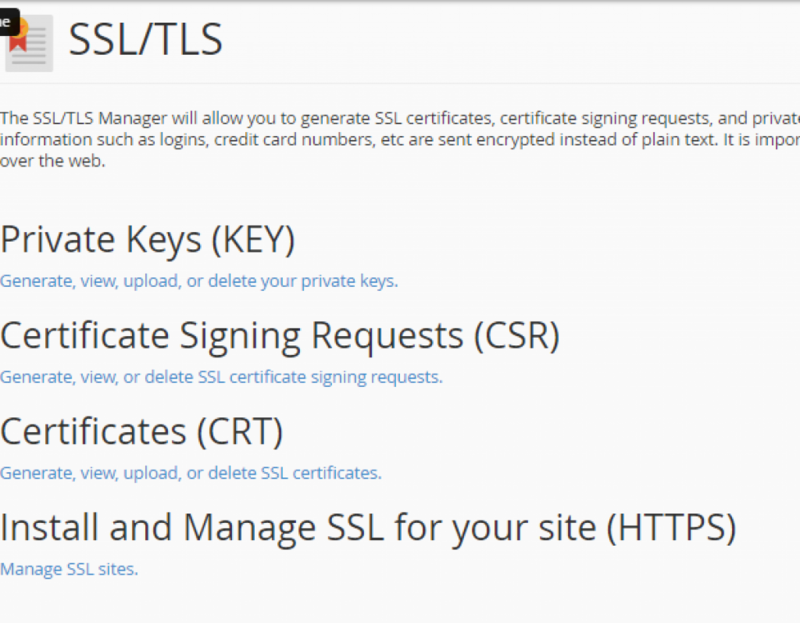 SSL/TLS Status : To know present status of your website’s SSL Certificate. SSL TLS : You can install Certificate through this option. SSL/TLS Wizard : You can install Certificate through this option too. Select SSL/ TLS Option. This will look like the below Image. Read carefully and follow the steps as mentioned in below screen shot. If you follow the steps properly, your certificate will be installed successfully. ( But before installing, don’t forget to purchase the Certificate from any renowned web hosting ). To get price offered by such web hosting companies, you may refer end of post, where the prices of SSL has been given. Even, if you wish I should write a detailed post regarding “How to install SSL Certificate”. Then comment below I will try my best to write step by step process. How much does an SSL Certificate Cost ? Below are some cheap & best offers for SSL Cost , offering by reliable web hosting companies. Comodo PositiveSSL Certificates : PositiveSSL is one of the most popular SSL certificates on the market, and for good reason. This inexpensive, hassle-free cert is an ideal entry-level SSL certificate solution for blogs, personal pages and other websites that don't transact large amounts of user info. Like all low-cost SSL solutions from Namecheap, PositiveSSL brings encryption, validation, and trustworthiness to your site. India's 1 HostingRaja provides 'Free SSL Certificate', if somebody buy their Hosting plan. Their lowest plan starts from Rs.65/mo onwards. 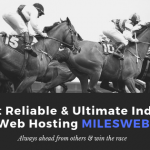 India's Leading web Hosting company 'Milesweb' offers 'Free SSL Certificate' with almost all popular Hosting plans. Hope, by reading this detailed article, one can understand the important of website security. Hence, they should not ignore the same and must install SSL.